"It's their own fault they got deceived? No, our deception's just that good!" The Japanese Card of the Day for April 28th, 2018, is a Megacolony Single Rare from V-Extra Booster 01: The Destructive Roar, everyone's favorite cigar-chomping ant criminal, Phantom Black. 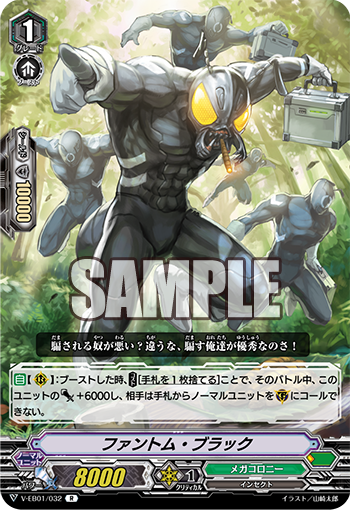 Phantom Black is a grade 1 on-boost version of Silent Tom attached to a discard cost and with a power boost, something which has interesting implications both for Megacolony and for Protect clans as a whole. 14000 power is no arbitrary number; it's the exact number required to make a 23k column with a 9k attacker, and Protect and Accel clans as a whole have already been shown to have lower average base powers than Force clans. With Phantom, we can run those 9k attackers assured that they'll break the all-important 28k threshold so long as they get one more bonus from a skill or trigger. The discard cost might sound heavy on paper, but these are some of the easiest costs for Protect clans to pay because they can discard their Gift for it; in a deck that receives another copy of Protect with every grade 3 ride and excels at dragging games out, you can expect to have a glut of Sentinel units available. In fact, Oracle Think Tank already has several cards themed around discarding to make use of this very property, with Chitose in particular specifically discarding Sentinels to take advantage of Protect. Another option is to run additional draws on top of your perfect guards specifically to pay discard costs. 6 Draw hasn't been in vogue for some time now, but Protect might be just the place for the old lineup to function. On his own, Phantom isn't exactly overwhelming. A 23k column will usually be guarded with trigger units regardless, because of Critical and Front Triggers innately having 15k shield in the Standard format. The card only begins to make an impact when its column crosses 28k, at which point Heals or a combination of two trigger guardians are the only viable ways to block, at which point you're potentially forcing the opponent to drop a waste an extra trigger guarding the remaining 5k--or otherwise force a Draw Trigger perfect out. Phantom and Silent Tom together suggest blocking normal unit guardians will be a feature of Protect clans as a whole, helping to make up for how they struggle to hit 28k+ without triggers. If this is the new design approach, it suggests even greater parity between clans than was first suspected. 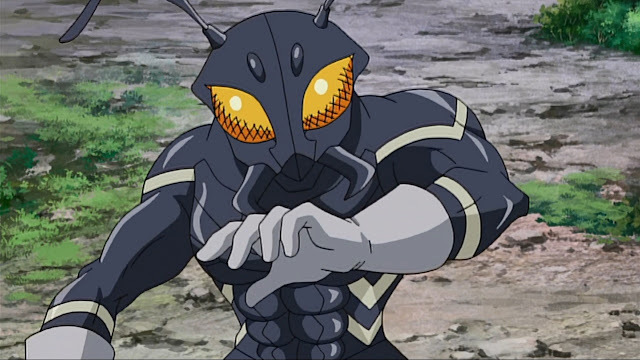 The previous Japanese Cards of the Day were Karma Queen and the four SVRs of V-BT01.